With the North American bird migration now underway and 950,000 registered buildings, the City of Toronto alone has the potential to kill 9 million birds every year. Toronto—April 8, 2014 Internationally acclaimed glass artist Sarah Hall has turned her attention one of the world’s largest killers of birds: high-rise glass architecture. It is estimated that 100 million to 1 billion birds annually are killed by collision with glazed buildings in North America. Toronto’s massive high-rise building boom over the last decade has led to an ugly designation: one of the highest rates of bird fatalities in the world. 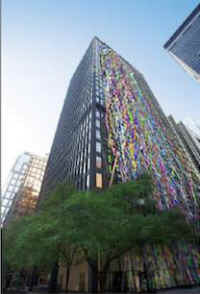 Most new hi-rise buildings use curtain-wall construction faced with glass. With the North American bird migration now underway and 950,000 registered buildings, the City of Toronto alone has the potential to kill 9 million birds every year. Hall’s new glass will build on existing research in the field by collaborating with leading international scientists, advocacy groups, research foundations, architects and manufacturers to develop a bird-friendly prototype that incorporates recent advances in organic solar technology. This new glass could provide utility scale clean energy that can be used to power the building itself. With a career spanning 30 years, Sarah Hall is a proven innovator in architectural glass. During the past 10 years she has worked to integrate solar technology into her architectural projects, challenging viewers to explore the connections between art, light and the preservation of our planet. Hall will create the design work in Toronto and develop her prototype with partners in the United Kingdom and Germany. The design and research phase of Hall’s project (April 2014 to September 2015) is supported with a grant from the Ontario Arts Council. See bird-friendly designs at Sarah Hall Studio.